It's time to put my electric car on Craigslist. The Electric Booger started life as a 1992 Mazda MX-3 Precidia. I bought it for a Winter beater, and after commuting with it for one winter I decided to convert it into an electric car. Firstly, this isn't a Tesla. It wasn't mean to be. It's a low budget EV conversion done right. If you know little about cars or nothing about electricity, this car is not for you. It requires periodic minor tinkering to make sure everything is a-ok. But so far after over 3000 km gasoline free, it has never left me stranded. I get in, turn the key on and drive. Get there, plug it in and walk away. Secondly, this car is not meant to fly down the freeway from Surrey to Vancouver and back every day. That's what $30K store bought EVs are for. This is an in-town/back road, short range commuter, and it excels at it. I really think it will be a hard sell. I don't think anybody in their right mind wants a beater MX-3 EV. (What does that say about me? :O) I am already dreaming up a contingency plan if I cannot get rid of it. First off, I will ditch the MX-3. It's in poor condition (dents and scratches), getting old (285,000 km/177,000 miles), and a bit porky (2332 lbs original curb weight). So if nobody wants it before my insurance runs out in May, I am stripping the EV goodies out of it and the scrap guy will haul the glider away. 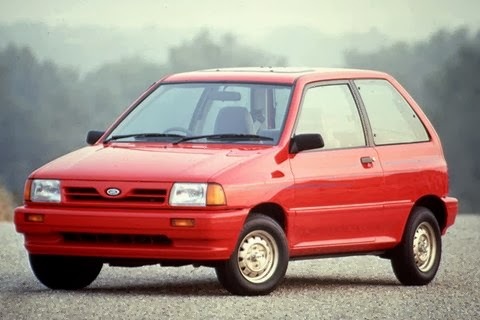 My first choice is a Ford Festiva. Maybe the coolest nerdy eco car ever. "Here, Cheyenne [my 4-1/2 year old daughter], draw me a car. Wow, perfect, you just drew a perfect looking Festiva." Curb weight of 1797 lbs. That's 535 lbs lighter. Also, I will likely buy a lithium battery pack, which will save an additional 574 lbs and actually fit in the car. With over 1100 lbs lost, I think I will be happy with my current motor and controller. My Alltrax 7245 controller is meant for 72V nominal but it has a max voltage of 90V, so with lithium I will be able to "cheat" a bit by going with an 80V system voltage (25 cells), where 90V will be 3.6VPC. Cool little blog. Came here after seeing your add on craigslist. Been looking into adding an electric motor into the rear of one of my Festiva's by using the rear out of an AWD Mazda 323. Connect the motor to the input with a simple chain drive. In case you don't already know if www.FordFestiva.com .